Produced by an international collective of artists across seven cities and over five years in the making, the first-ever feature-length Indiana Jones radio adventure will air on The IndyCast starting April 5th 2019. Released as a special episode, this fan-made full-cast audio drama is the marquee event in a diverse multimedia release including a screenplay, soundtrack, illustrations and more. The project was spearheaded by longtime IndyCast co-host Keith Voss, who conceived of the story’s central macguffin and served as the team’s executive producer. It was then relayed to playwright and producer Tim Bungeroth, who transformed that vision into a feature length screenplay. Finally, that screenplay was adapted for audio by Raiders Radio founder Alex Levitsky, who not only engineered the drama and its unique score but also voiced the role of its titular hero. Behind them was a mountain of Indy fans and creative professionals who worked on and encouraged the project throughout its five-year development cycle. 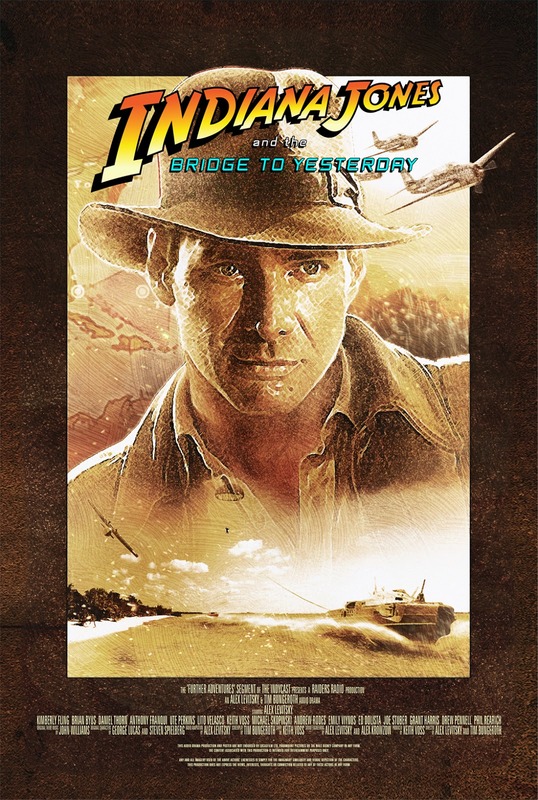 Like in any classic Indy adventure, the production team endured many twists and turns along the way but, in the spirit of their story’s iconic hero, ultimately emerged with an artifact to share with the rest of the fans. Voss, who had originally adapted some of Indy’s Marvel comics into audio dramas, worked on the story in various mediums until he was approached by playwright and IndyCast listener Tim Bungeroth. It was this focus on character during their initial story meetings that propelled Voss and Bungeroth to grow beyond making a small side story and commit to creating a feature length screenplay. After about a year of refining the script and searching for other collaborators, Bungeroth and Voss were approached by the versatile Alex Levitsky who auditioned for the role of Indiana Jones. After nailing the lead role, Levitsky revealed his expertise for audio engineering and was ultimately entrusted with adapting the screenplay into a radio drama. In addition to adapting and engineering the drama, Levitsky also took on the task of crafting an original score composed primarily from the works of John Williams. Despite all the effort and hard work, the drama still needed a home where it could be broadcast, and there was no better platform then the most well known Indiana Jones fan podcast on the planet. As Dolista continues to carry the torch of Indy fandom, he’s excited to finally share this project with the very community he’s worked so hard to connect. For more information and to make sure you tune into the IndyCast visit the official site. We couldn't be more appreciative and proud, thank you! We hope everyone get's a chance to sit back, cool their heels and 'Remember The ADVENTURE'!